PA chief negotiator says the results of the elections means PA will continue to pursue Israel at ICC. The Palestinian Authority (PA) was not pleased on Tuesday night with exit polls in Israel that showed that Prime Minister Binyamin Netanyahu is the favorite to head a government. 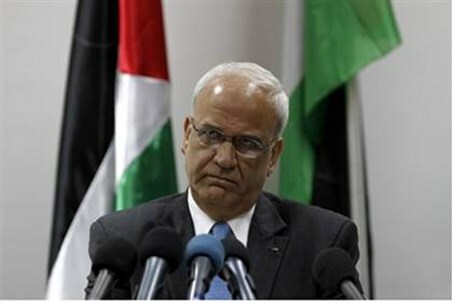 Speaking to AFP, the PA’s chief negotiator Saeb Erekat said that the results of the elections meant that the Palestinians will continue their unilateral efforts against Israel in the international arena. "It is clear that Prime Minister Benjamin Netanyahu will form the next government, so we say clearly that we will go to the International Criminal Court in the Hague and we will speed up, pursue and intensify" all diplomatic efforts, he declared. The PA has taken a series of unilateral moves against Israel in recent months, including an attempt to pass a resolution, backed by the Arab League, calling on Israel to withdraw from Judea and Samaria by 2017. The resolution was put to a vote in the UN Security Council, but failed to secure enough votes in favor to pass. The PA followed up that move by presenting a request to the United Nations to join the ICC. Israel responded by freezing the transfer of tax revenues to the PA, and Erekat responded by accusing Israel of trying to topple the PA.